Perhaps, this has been one of the most awaited posts on this blog. I have received many emails from readers about Taste of Mysore minus Mysore Pak post. 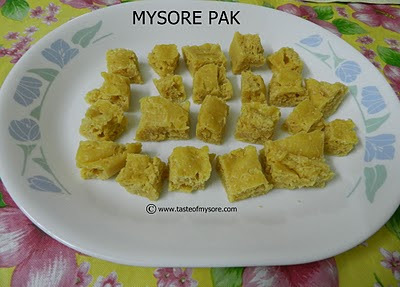 Presenting hero of the city of Mysore.....Mysore Pak. This post comes from a Mysore Pak fan, Nandita Srinath. She had emailed me the recipe but when I requested her for a picture, she took out some time to make them and send me the yummy click too.. Thank you Nandita. 2. Dissolve sugar in 2 cups of water.Use a heavy bottomed pan. Wait till all the sugar is dissolves completely with no residue sugar or else the whole gram flour will become a lump. 4. Keep on stirring and turning the mixture constantly or else it will get burnt. 5. Continue stirring it till it starts leaving the sides of the vessel and attains honey comb shape and then pour it into a ghee smeared plate. 6. Cut into desired shape when it is still hot. Eat and Enjoy. If you have still not decided what to make for Ugadi, Nandita's Mysore Pak is tempting enough to keep it as an option. wish ya happy week ahead,..
lovely mysorepak and a happy ugadi to u.
mysore pak is something which I am eagerly waiting to make someday..looks wonderful and yummwow..must have had a great time at GIIS...what a lovely match..happy Ugadi..
wow this is my favourite sweet...best sweet to celebrate the great occasion!!! Happy Ugadi, mysore pak looks gud ! Happy Ugadi to you and family...the mysore pak is one of my favorite sweets...looks just right. Happy Ugadi,Looks like you had a great time,mysore pak looks tempting! 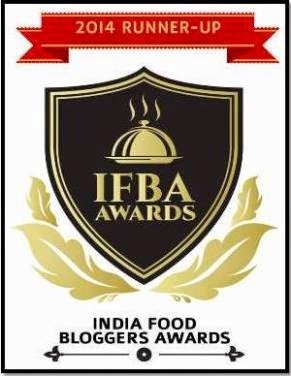 you will have the best Mysore Pak ever ! Ugadi subhashayagalu ......ugadi sweets got sweeter thanx to the World Cup ! Happy ugadi wishes to u and ur family...Mysore pak looks super delciious..
haha! this is fun! very authentic recipe:)obviously-taste of mysore! 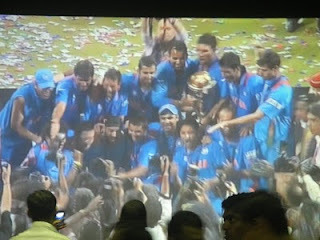 I watched the last 8 overs, heehe that is it! Happy Ugadi to u and ur family! The sweet looks great! Wish you and your family a very Happy Ugadi .. Happy Udagi... ellu bella habbada shubhashaya...Yep! Congrats on the World cup.. we loved it too.. Happy Ugadi laxmi..ofcourse belated wishes...Love mysore pak..looks really yumm...and I too enjoyed d match to the core..